There is much more to the beginning of Lent than ashes alone, and we encourage you to make time for worship with a community of faith, for the support of others and of the great traditions of faith in our work of repentance and renewal. But God meets us not just in worship, but in the midst of life, and we offer the opportunity to remember our faith to those whose schedules make it hard to stop and pray with others on a busy Wednesday. 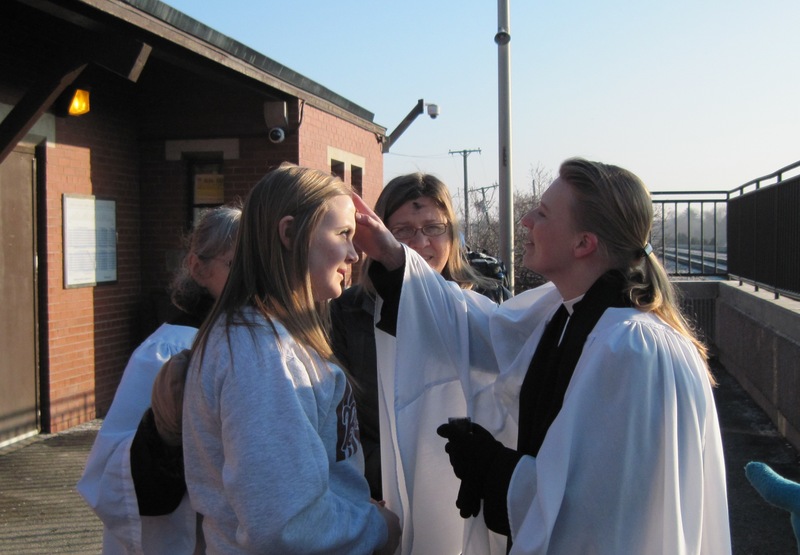 On Ash Wednesday 2010, three Chicago-area Episcopal congregations independently took ashes and prayer to suburban train stations, and discovered commuters hungry for a moment of prayer, renewal and grace. Those who had no time to attend services or had forgotten about the tradition were delighted to receive ashes with prayer as they began their day. Many responded with tears or smiles of gratitude that the church would come to them. Leaders in the three congregations who offered Ashes to Go agreed that this was too good to keep to ourselves, and we decided to invite others to join us. 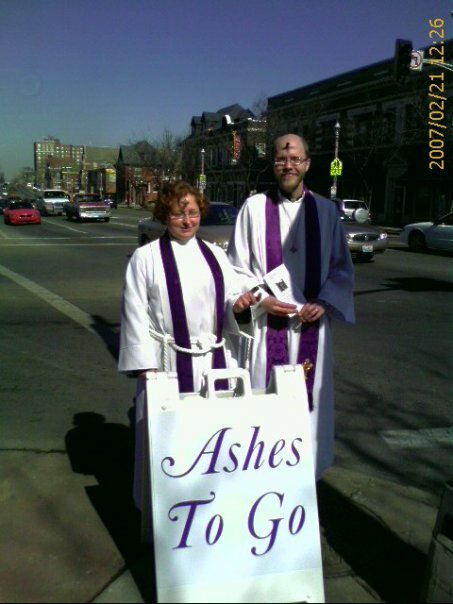 Churches in San Francisco, St. Louis and elsewhere had offered similar ministries for years, but in 2011, the Episcopal Diocese of Chicago chose to coordinate Ashes outreach, and more than 25 Episcopal congregations and organizations around the Chicago area offered ashes on street corners and train platforms, coffee shops and outside grocery stores. In 2012, Ashes to Go went viral and national. Because of the coverage in Chicago the previous year, many people were looking for resources to launch their own Ash Wednesday ministries. I started this site to offer easy access to the resources I and others had developed, and to share the great images and stories that came out of street corner ministries. Interactions on this site help give a sense of the size and momentum of the movement. In 2012, more than 80 churches in 21 states headed out to meet the world with ashes and prayer – and the gift of prayerful outreach made the national news. It’s rare to find a story about the church’s mission on the front page or the morning news, but in 2012 the USA Today told a story of good news, and it was picked up on CBS This Morning. Pastors and people who took ashes out of the church building reached people who never even saw them because Ashes to Go is photogenic, inviting, and creative. It creates opportunities for people to take a fresh look at the church and the gospel. In 2013, Ashes to Go (or in some contexts “Ashes Take-Away”) went international – in Canada, the UK and South Africa. Our site had information on *** Ashes offerings in 31 states and the District of Columbia, and there were certainly many more offered. Ashes to Go is not trademarked or licensed or limited to certain sectors or brands of Christianity – this site is meant as a free resource to people who are interested in this holy adventure in any way. My goal on this site is to support the planning and help to tell the stories of an imaginative, vital, holy way in which more and more churches are setting out to meet God’s people where they are. So let’s get out into the world! I belong to an ecumenical Bible Study made up of clergy in the Tower Grove area of St. Louis, Missouri. In our group, there are clergy from the Presbyterian Church USA, Disciples of Christ, United Church of Christ, American Baptist, and Mennonite traditions. St. Louis is a heavily Roman Catholic city. When I do a wedding, for example, no matter how many invitations I make during a service, Roman Catholics will not take communion from me. We realized that offering a brief Ash Wednesday liturgy on the corner of the business district in our progressive neighborhood during the lunch hour might actually be a good opportunity for evangelism and pastoral care, especially since all of our congregations are open and affirming to LGBT people. We ordered two weighed A-frame signs with “Ashes to Go” printed in purple script on both sides. We talked to Maureen “Mo” Costello, the owner of MoKaBe’s Coffeehouse, which is located at a major intersection in the Grand South Grand Business District, who agreed to put out a tent and free coffee to offer those who participate in Ashes to Go. My curate at the time, the Rev. Andrew Benko, crafted a shortened Episcopal-based liturgy for Ash Wednesday to use in our brochure/bulletin, and we included contact information about all of our participating churches. 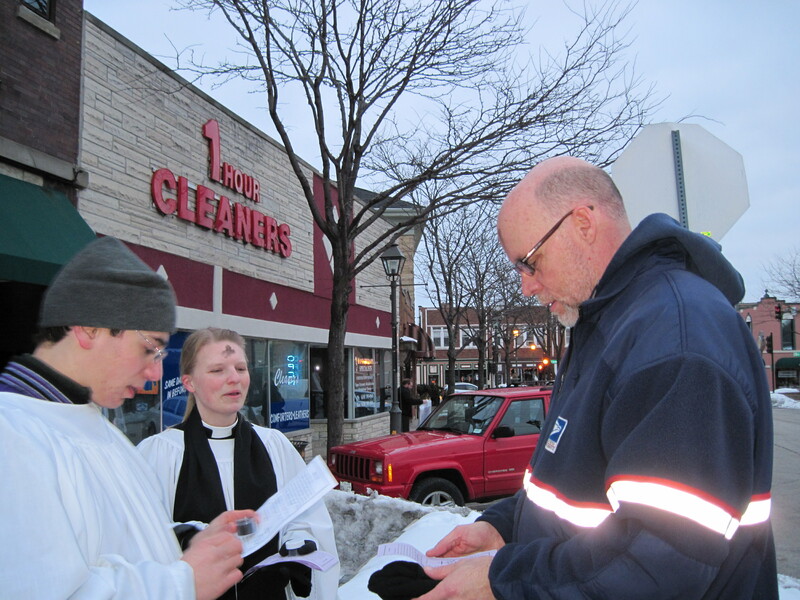 The first year – 2007, I believe – we shared the Ash Wednesday liturgy (or at the least the imposition of Ashes) with at least one hundred passers-by, including people on bicycles, on foot, and even on public transportation! Although the number of passers-by on South Grand depends on the weather on any given Ash Wednesday, every year, the driver of at least one Metro bus has pulled over so that we may impose ashes to passengers on the bus! Every year, we have moving conversations with people; I have even heard some confessions. Most years, more people attend Ashes to Go than attend the two Ash Wednesday services we offer at St. John’s itself. On the street corner, we encounter people who have been hurt by previous experiences with organized religion and who, through Ashes to Go, take a tentative step back towards attending Church. What started as somewhat of a joke among a few of us clergy has become a meaningful, ecumenical, neighborhood event every Ash Wednesday. Every year since 2007, an ecumenical group of clergy from the Tower Grove area has offered Ashes to Go on the corner of Grand & Arsenal. Every year, MoKaBe’s graciously sets up a tent and free coffee for us. On years when it is cold outside, MoKaBe’s sets up their fire pit, too. We are heartened to know that Ashes to Go has spread to the Diocese of Chicago, downtown St. Louis, California, New York City, and other places. I am grateful to my friend, the Rev. Emily Mellott, for spreading the word about “Ashes to Go.” Ashes to Go can be a powerful way for people in encounter Christ where they are, in the midst of their lives.